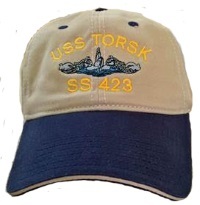 USS Torsk ball cap in navy blue with embroidered gold lettering and silver dolphins. Cap is 100% cotton twill with a rear Velcro band for size adjustment. USS Torsk ball cap in unstructured khaki with blue bill and embroidered gold lettering and silver dolphins. Cap is 100% cotton twill with a rear Velcro band for size adjustment. USS Torsk ship’s patch, 5-inch diameter with iron-on backing. Perfect for sewing on jackets and USSVI vests. 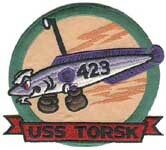 USS Torsk patch. Great for jackets and USSVI vests. All prices include free shipping within the 48 United States. Please contact us for international rates!